(Nanowerk News) Every year, an estimated half-million Americans undergo surgery to have a stent prop open a coronary artery narrowed by plaque. But sometimes the mesh tubes get clogged. 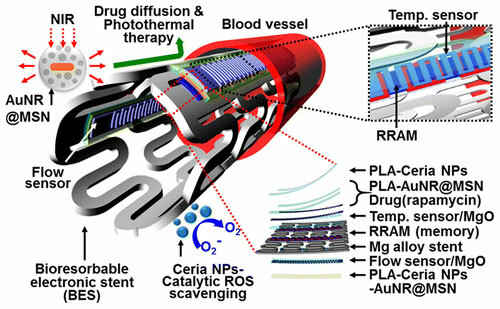 Scientists report in the journal ACS Nano ("Bioresorbable Electronic Stent Integrated with Therapeutic Nanoparticles for Endovascular Diseases") a new kind of multi-tasking stent that could minimize the risks associated with the procedure. It can sense blood flow and temperature, store and transmit the information for analysis and can be absorbed by the body after it finishes its job. Doctors have been implanting stents to unblock coronary arteries for 30 years. During that time, the devices have evolved from bare metal, mesh tubes to coated stents that can release drugs to prevent reclogging. But even these are associated with health risks. So researchers have been working on versions that the body can absorb to minimize the risk that a blood clot will form. And now Dae-Hyeong Kim, Seung Hong Choi, Taeghwan Hyeon and colleagues are taking that idea a step further. The researchers developed and tested in animals a drug-releasing electronic stent that can provide diagnostic feedback by measuring blood flow, which slows when an artery starts narrowing. The device can also heat up on command to speed up drug delivery, and it can dissolve once it's no longer needed.